Flash Facts - English video lessons on ECTV! 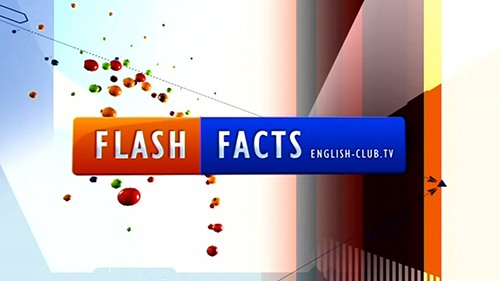 Flash Facts is one of the many English video lessons brought to you by English Club TV. It boosts general knowledge in viewers. It delivers real life facts in high-speed style in the Flash Facts programme aiming to improve English education. The programme covers little known facts in animal life, Geography, and human Biology. Facts are stated all in a row with no intervals in between to divide the programme. The idea is to make you listen attentively. These English video lessons help listeners to develop their listening capacity and enhance their knowledge. Flash facts also introduce Statistical data through English video lessons. Numbers displayed on the screen make matters easy.